Although marketers used to focus heavily on promotional emails like Newsletters and Offers emails, transactional emails now have been given a boost by the web and mobile applications that mainly rely on email to deliver notifications, updates, and subscriptions. And why is that? It’s the importance of transactional emails; some studies show that the open rate for transactional emails exceeds that of any other type of emails; it gets 4-8x more opens and clicks than other emails. So why not benefit from it? What is Transactional Email? and Why Customers engage with it on higher rates? Transactional emails are the emails that you send after your customers’ particular action such like signed up for a new account, order an item, shipping details, and delivery confirmations. You send it to notify your customers of their last activity or to confirm an action they did. That’s mainly why customers engage with transactional emails at a much higher rate than they do with any promotional emails! Do you know that most of the marketers follow the 80/20 rule when it comes to transactional emails; 80% of the content in the email relates to the facilitation or confirmation of the action, and the remaining 20% of the content can be used for promotional purposes, such as an upsell or cross-sell. 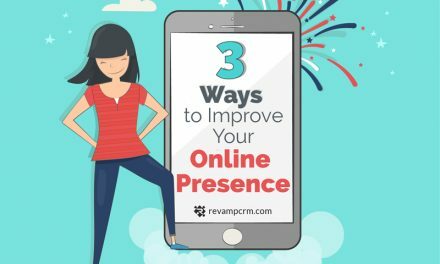 In addition, transactional emails can be part of the first impression a new customer has of your online store, so you need to make it count, it’s your easy way to build brand awareness and you’re your customer loyalty. That’s why we prepare these 6 tips for your perfect transactional emails. Your customers are expecting to see confirmation, follow-up or notification emails in their inboxes as soon as possible after taking any action, they need to make sure that their transactions went through successfully. Consider an email footer with quick links to the pages your customers are likely to need or place this links in a proper place with a big font, bold, calls-to-action that address their most likely needs based on the type of email they are receiving. Being proactive and anticipating what your reader is going to need is a great way to provide personalized value. 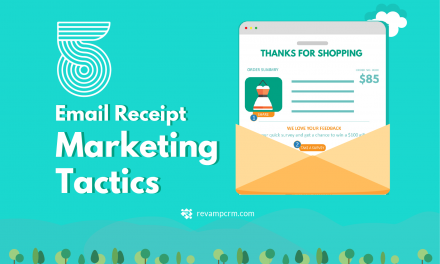 You may add some relevant product details at the end of your email; many shoppers keep transactional emails as a record to remind them what exactly they purchased and as a receipt. By including product information like the quantity, size, and color, they’ll be able to verify that their information is correct. Who doesn’t like seeing his/her name? 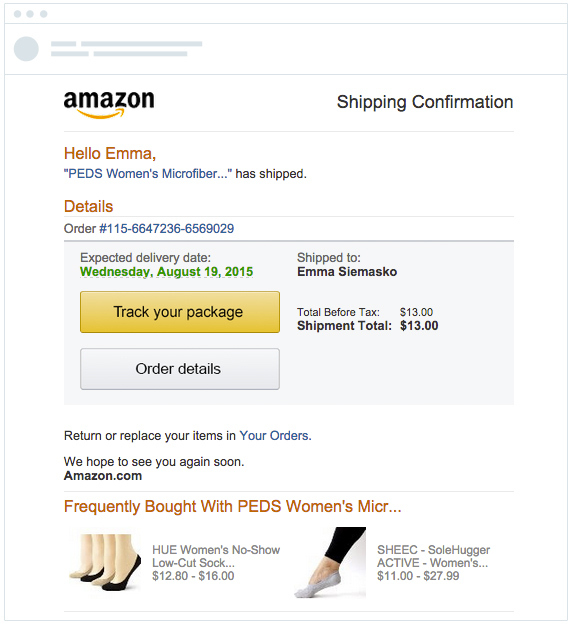 Transactional emails are easily personalized since they are generated when a customer performs some action; ordered something or added items to their shopping cart and forgot about them. It’s easy to get your customer name dropped in from the order. And make sure the sender name is your brand, and it’s from an email that people can reply to and ask any questions about their order. People are much more likely to interact with an email that seems like it’s from a person than a machine. As most people look first at the sender name, then decided whether to open or trash the email. 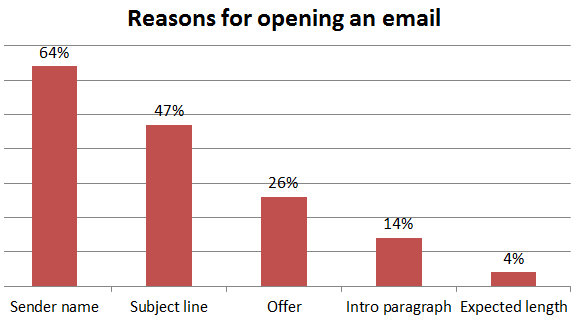 64% of subscribers say that their biggest reason to open an email is the because of who it is from, which make it much more important than your subject line! Especially emails related to shipping notifications, you should allow your customers to track their order. You can include an estimated delivery date or even better, a tracking link. This can also help cut down on incoming messages from eager customers wanting to know just where their order is. Click rates for shipping and buying confirmations that fail to include a “Thank you” notice in their subject lines are 35% lower than otherwise. Avoid this large loss by placing a clearly visible thanks in all of your transactional messages. 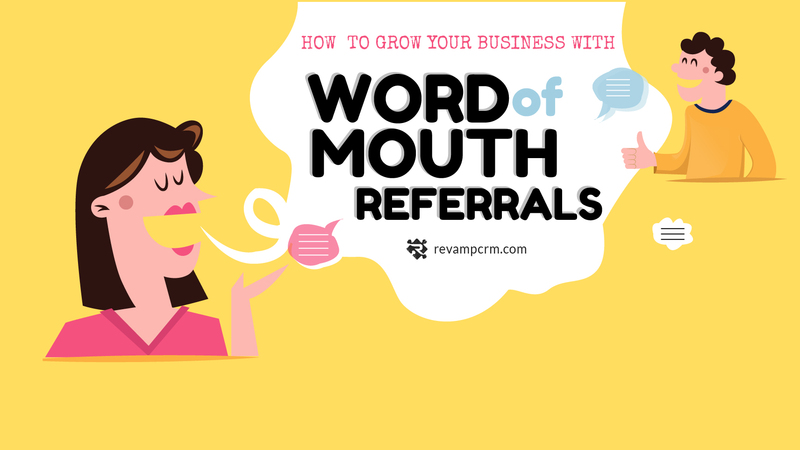 You should be regularly thanking your audience for participating. And it’s good to put your Social Channels Buttons clearly visible into all of your transactional emails, it can not only help spread the word about your brand but also boost your email click rates by 55% or more. As we mentioned above, transactional emails present a huge opportunity for marketers as subscribers opens them at a higher rate than other emails. That’s how you have the opportunity to take them a step further than just confirming the success of a transaction. Send transactional emails that correlate well with your customers’ journey. Earn their loyalty and trust; try to anticipate their needs by including easily accessible links to your customer care team or a direct phone number, to use it in case they need to get in touch with you or face any problem, like choosing the wrong shipping address, quantity, or size, it will make them feel that you really care about them not just want to sell your product to them. Put a subject line that clearly summarizes the purpose of your email. Avoid adding promotional ads in the subject line or your email could be flagged as spam. Write your copy that acknowledges and thanks the subscriber for their activity. Include a recognizable and clickable brand logo and incorporate your brand colors to boost brand recognition. Use links that serve a specific pages in your online store. 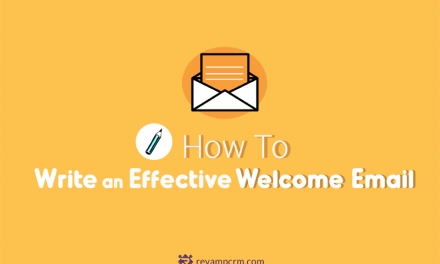 The secret of the perfect transactional email is to be Friendly, Informative, and Timely.